Introduction: Sustainable development of higher educational systems, as a dynamic system, requires a coherent moderate growth both in qualitative and quantitative dimensions. Since students are the major clients of higher education systems and their perspectives can play a key role in the quality promotion of the services; this study has been conducted based on SERVQUAL model aiming at the assessment of educational services quality in Kashan Medical Science University in 2016. Study Methodology: A total of 212 students of Kashan Medical Science University were selected with a population of 616 subjects through random sampling, using Morgan tables for this descriptive-analytical research. Data collection tools were the standard SERVQUAL questionnaire composing of three sections of basic information and 28 items, according to Likert six-option scale for the measurement of services quality current and desired expected conditions. The difference between the average of current and desirable statuses was measured as the services gap. Descriptive deductive statistics were used to analyze the obtained data. Results: The students aged averagely 23 ± 1.8, 65% (138 subjects) were female, and 35% (74 subjects) were male. About 72% (153 subjects) were single, and 28% (59 subjects) were married. The obtained results revealed that there was a negative gap in all dimensions of quality. The results also showed that the minimum gap obtained for learning assist tools (physical and tangibility dimensions) with an amount of −0.38 and the maximum gap for guide instructor availability once needed by the students (accountability dimension) with an amount of −2.42. Total mean of perceptions and expectations measurement for the students obtained 2.28 and 3.85, respectively. Conclusion: Respecting the negative gap obtained for all dimensions of educational services quality and insufficiencies to meet the students' expectations, it is recommended to assign further resources along with appropriate management initiations, modification, and rearrangement of the services providing models to improve the quality of educational services for higher education centers all around the country. Lots of organizations are providing public services to many people in all societies as well as training or educational center services which not only plays a vital role in services providing to knowledge and research-seeking students in society but also their services are in such a way that all the sectors of the society can benefit from them. Universities and higher educational institutions, as the highest level of speculation, thought, and science exchange at the societies can dramatically affect a society by their scholars, researchers, and students. The way how and what level of educational services they enjoy is in fact an important matter for assessment  which paves the way for success and survive of higher education systems. On the one hand, the quality means a multifashion concept in higher education systems, and on the other hand, focusing on clients'(students) needs and expectations means attention to the quality and service providing to the them. Hence, evaluating educational services will be brought into result once assessing the student expectations (desirable status) compared with the provided educational services (current status). The lower the gap between the student expectations and the provided services is, the more it reveals the desirability of educational services provided. SERVQUAL model is a popular remarkable tool for service quality assessment. Similar studies conducted in Canada, China, Singapore, and Iran, also demonstrated a negative gap in all dimensions of educational service quality. Given the fact that universities are shifting from quantitative to qualitative phase, these versions of studies seem indispensable. As a result, being informed from the current educational services status of Medical Science Universities seems to be a suitable baseline for planning and improvement of educational service quality. It will lead to better qualified health-care services and reduction of quality problems of educational services. The purpose of this study was to evaluate the quality of educational services of Kashan university of medical science, based on SERVQUAL model from the viewpoints of medicine students. The present descriptive-analytical study was performed in Kashan Medical Science University in 2016. The study population included 240 subjects as per the population size (616), using Morgan tables. Subject to the reality that numbers of students were studying asstagers (72 out of 180), remote learning students (53 out of 136), physiopathology students (40 out of 100), and basic science students (80 out of 200), sampling conducted as a class of different groups proportional to the total, and the questionnaires were distributed among them. Data were collected through the standard SERVQUAL questionnaire, comprising two parts; personal information of the students and five dimensions of service quality (including guarantee, accountability, empathy, confidence, and tangibility). Physical tools, utilities, staff and communicative approaches, for tangibility, ability of the organization to execute the services obliged against the students, for guarantee, staff level of accountability against the provided services, for accountability, capability, knowledge, and skills of the staff of educational services in creating confidence in students, for confidence, and sense of belongingness and commitment of the staff toward the students, for empathy, were the items of the questionnaires. The questionnaire included 28 items based on a six-option scale, organized in two parts; expectations (very high = 5, high = 4, relative high = 3, relatively low = 3, low = 2 and very low = 0) and perceptions (very good = 5, good = 4, relative good = 3, relatively bad = 2, bad = 1, and very bad = 0). The students responded to the items relating to the current status in perception part and to the items regarding to the future or desired status in expectation part. The educational services gap obtained by the difference between the perception and expectation levels score. Positive gap score suggested an over expectation educational services quality to the students and negative one meant that there was a gap and the educational services quality were less than the level expected by the students. SERVQUAL tool has been already used for many purposes, and the stability and validity of it have been repetitively verified.,, Nevertheless, the validity and stability of the questionnaire were verified before using for the research. To define the scientific validity and scientific confidence (stability) of the research tools, context validity method through expert's perspectives, and internal stability of the questionnaire using Alpha Cronbach coefficient 0.86 were used, respectively. Data relating to the research units were analyzed through SPSS software version 16 (SPSS Inc., Illinois, USA) (Leland Stanford Junior University). The assumption of the tested variables normality and total gap score in five-option tool for service quality were evaluated before using parameter tests, through Kolmogorov–Smirnov test and in case of normal data, parameter tests were used, accordingly. A total of 212 out of 240 questionnaires were filled out by the practitioners. The students were averagely 23 ± 1.8-year-old, 65% (138 subjects) were female, and 35% (74 subjects) were male. 72% (153 subjects) were single, and 28% (59 subjects) were married. 76 students studied in basic science, 49 were remote learning students, 33 students studied physiopathology, and 54 students were stager students. The preassumption of normality of the tested variables, the total gap score of educational services quality five dimensions was evaluated through Kolmogorov–Smirnov test. P > 0.05 obtained for each part, parameter tests were applied. In [Table 1], the current and expected status average scores are shown for each dimension of educational service quality in viewpoints of students and the present gaps. The students' scores for all 5 dimensions of the 28 items of the perception part (current status) obtained lower than the ones for expectations (expected status) which consequently resulted in a negative gap score for all dimensions. Minimum gap observed for learning assistant tools quality item (physical and tangibility dimension) with −0.38 and maximum gap obtained for guide instructors availability once needed by students (accountability dimension) with −2.42. For abundance distribution of service quality, the study results demonstrated that 89% (189 subjects) have recognized a negative gap for educational services quality in terms of total service quality. 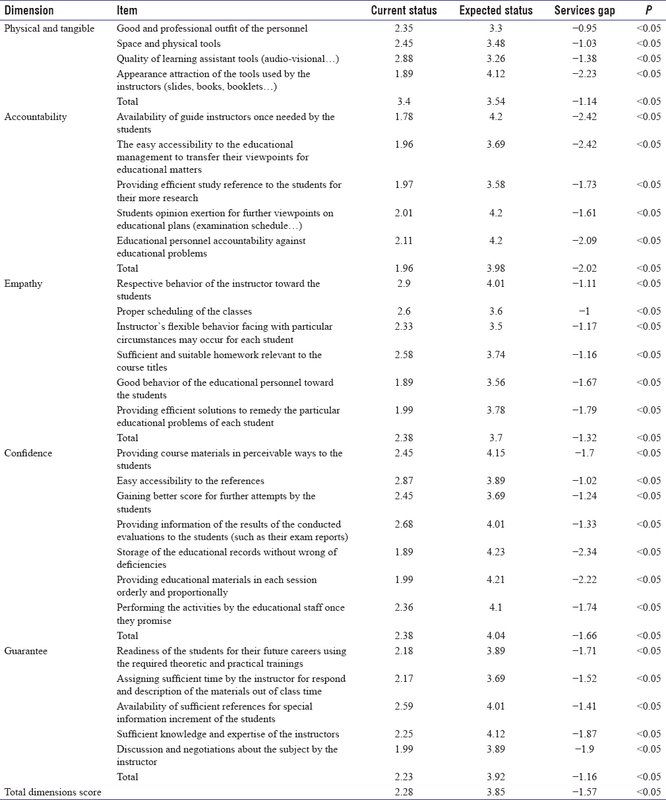 Among the five dimensions studied, a bigger number of the students evaluated the accountability as a negative gap, and a fewer number recognized physical and tangible dimensions as the negative gap [Table 2]. The hypothesis of being a relationship between gender, marital status, and the quality gap, was evaluated using t-test, and the results suggested that there was a statistical significance difference for physical and tangible factor, in terms of gender (P = 0.012) and for empathy factor, in terms of marital status, (P = 0.08) and guarantee (P = 0.027). Moreover, in the researches carried out in other countries like the U. S and China, similar findings reported.,,, These findings asserted the opportunities for improving the service quality in all dimensions. For physical and intangible dimensions, the appearance attraction of the consumed tools was more criticized by the students. For accountability, accessibility to the guide instructors by the students has been further criticized once needed by them. For empathy, the behavior of the registrar or education administrative staff was not considered as desirable for the students. For confidence, register and keeping the student educational records have not been out of mistake or deficiency. Quality guarantee involves knowledge, capabilities, and modesty of the staff for more reliance and intimacy. The gap observed in this dimension demonstrates that discussion and debate on the course subjects in the classroom drew more attentions by the instructor. For the student further research, the updated references are not accessible to the students for 18 h a day. The theoretical and practical courses need more coordination and coherence to prepare them for their future careers. A negative gap of such factors also reveals the insufficient and unsuitable consulting time, low flexibility of the course structures, and insufficient diversity for overtime curriculums. Negative gap among all the educational services quality dimensions also demonstrates the reduced educational quality compared with the expectations of the students, such that similar in-line results have been reported for the likely studies of Bahreini et al(2010) in Shiraz Medical Science University, Jafari Asl et al in Shahid Beheshti Medical Science University, and Beheshtirad et. al in Oroumieh Medical Science University. Respecting the aforesaid results, maximum gap was seen for accountability dimension, which was in accordance with the findings obtained by researches from Shahrood, Hormozgan, Zahedan, East and West Azerbaijan.,,, The contents of this dimension including the students' views of point applying on their curriculum, availability of the guide instructors when needed, accountability of the registrar or educational staff on education difficulties, pointed out that they were not time and budget consuming but revisable through brief trainings. Nevertheless, in general, referring to the lack of resources as a coming challenge faced with all organizations, this gap could be reduced through prioritization and budgeting for the maximum gap dimensions. By the virtue of this research results, one can categorize the aforesaid five dimensions into three prioritizing group for resource assignment and organization attempts, to remedy or reduce the quality gap, such that accounting dimension is the maximum and physical dimension will be the minimum prioritized rank. Hence, it is suggested to organize training workshops for learning service provision to the clients and to make communication with them and also increment of technical skills of the staff especially for the faculty members to update their educational information and methods. Furthermore, establishment of an efficient suggestion or information system for online ad sufficient informative services in the field of conducted researches by education departments will assist improving educational services quality and reduction of the gap between the current and expected status. Regardless of gender or local conditions, negative gap in all dimensions of educational service quality indicated failure of meeting the students' expectations. It seems that some items were being improved through proper administrative actions or revision and rearrangement of the educational service quality models. The most substantial challenge faced with the students in this study was the lack of their confidence upon readiness for their future career based on the available theoretical and practical learnings which shall be expedited for further considerations and assessments. The educational administrative staff did not indicate proper readiness for accountability, and there were not sufficient educational facilities and equipment for the students and the promising commitments were not appropriately met by the in charges. Hence, it is suggested that in addition to a troubleshooting for educational service quality, training courses about the communicative skills of the staff and training workshops are required for learning upgraded educational methods and efficient communication approaches between the students and the faculty members or the instructors, accordingly. The study constraints involved limited accessibility to the employed students during the last educational years. In addition, as for the research conduction on one university student only, and limitations for the results expansion, it is suggested that similar studies to be performed in other universities meanwhile using qualitative approaches to reach full content information along with SERVQUAL model. In the end, we are appreciate from Clinical Research Center of Shahid Beheshti Hospital of Kashan University of Medical Sciences experts and department of research of kashan university of medical sciences. Shafi'iRoudposhti M, Mirghafouri H. Identification and ranking of the effective factors on improvement of the quality of educational services in higher education, A case study: Management faculty of YAZD university. J Iran High Educ 2008;1:67-93. High Council of Cultural Revolution, Cultural and Scientific Monitoring and Evaluation Board. Shakhes hay arzyabi amoozesh aali jomhoori eslami Iran. Tehran; 2004. Aghamolaei T, Zare S, Abedini S. The quality gap of educational services from the point of view of students in Hormozgan University of Medical Sciences. Strides Dev Med Educ 2006;3:78-85. Ghalavandi H, Beheshtirad R, Ghale'ei A. Investigating the quality of educational services in the University of Urmia through SERVQUAL Model. Q J Manage Dev Process 2012;25:49-66. Ham CL. Service Quality, Customer Satisfaction, and Customer Behavioral Intentions in Higher Education; 2003. Available from: http://www.sunzi.lib.hku.hk/ER/detail/hkul/2984797. [Last accessed on 2015 Jul 25]. Parasuraman A, Zeithmal V, Berry LL. SERVQUAL: A Multiple-item scale for measuring consumer perception of service quality. J Retail 1988;64:12-40. Abbasian M, Chaman R, Mousavi S, Amiri M, Taromsar MG, Maleki F, et al. Gap analysis between students' perceptions and expectations of quality of educational services using servqual model. Qom Univ Med Sci J 2013;7:2-9. Beheshtirad R, Ghaleei A, Ghalavandi H. Educational services quality; Distance between current and desirable situations. Educ Strateg Med Sci 2013;6:49-54. Parasuraman A, Zeithaml VA, Berry L. SERVQUAL: A multiple item scale for measuring consumer perceptions of service quality. J Retailing 1988;64:12-40. Tofighi S, Sadeghifar J, Hamouzadeh P, Afshari S, Foruzanfar F, TaghaviShahri SM. Quality of educational services from the viewpoints of students SERVQUAL model. Biomonthly Educ Strategy Med Sci 2011;4:21-6. Enayati Novinfar A, Uosefi M, Siyami L, Javaheri Daneshmand M. Evaluation of the quality of education services of Payam Noor University of Hamedan based on the SERVQUAL mode. Q J Res Plann High Educ 2011;17:135-51. Rasoolabadi M, Shafieian M, Gharibi F. Assessment of the quality of educational services by the SERVQUAL model: Viewpoints of the students at Kurdistan University of Medical Sciences. Sci J Kurdistan Univ Med Sci 2013;18:104-12. Danaei S, Shahamat S, Khatoni A, Ghodsi S, Hashemi M. The quality of educational services: Gap between optimal and actual status according to dentistry students. Iran J Med Educ 2012;11:685-9. Arbooni F, Shoghli A, Badri Poshte S, Mohajeri M. Studying the gap between expectations and educational services provided to students of Zanjan University of Medical Sciences in 2006. Steps Dev Med Educ 2009;5:17-25. Zavvar T, Behrangi MR, Asgarian M, Naderi E. Evaluating service quality in educational centers of university of Payam Noor in East and West. Q J Res Plann High Educ 2008;13:67-90. Sabahi-Bidgoli M, Mousavi GA, Kebriaei A, Seyyedi SH, Shahri S, Atharizadeh M. The quality of hospital services in Kashan educational hospitals during 2008-9: The patients' viewpoint. Feyz 2011;15:146-52. Tofighi SH, Sadeghifar J, Hamouzadeh P, Afshari S, Foruzanfar F, TaghaviShahri SM. Quality of educational services from the viewpoints of students SERVQUAL model. Educ Strateg J Med Sci 2011;4:21-6. Ranjbar Ezzatabadi M, Bahrami MA, Zare Ahmadabadi H, Nasiri S, Arab M, Hadizadeh F, et al. Gap Analysis between perceptions and expectations of service recipients through Servqual approach in Yazd, Afshar hospital. Tolooebehdasht 2010;9:75-86. Ayatollahi J, Sharifi MR, Marjani N, Ayatollahi F. Assessing Quality of education services at Shahid Sadoughi University of Medical Sciences in 2010. Med Educ Dev 2012;7:21-30. Tan KG, Kek SW. Service quality in higher education using an enhanced Servqual approach. Qual High Educ 2004;10:17-24. Chua C. Perception of Quality in Higher Education. AUQA Occasional Publication; 2006. Available from: http://www.auqa.edu.au/auqf/2004/program/papers/Chua. [Last accessed on 2012 Apr 10]. Bradley RB. Analyzing Service Quality: The Case of Post-graduate Chinese Students; 2006. Available from: http://www.leeds.ac.uk/researchProgs/fileadmin/user_upload/documents. [Last accessed on 2012 Apr 10]. Richard E, Adams JN. Assessing college student perceptions of instructor customer service to students questionnaire: Assessment in higher education. J Assess Eval High Educ 2006;31:535-49. Bahreini M, Moattari M, Kaveh MH, Ahmadi F. A comparison of nurses' clinical competences in two hospitals affiliated to Shiraz and Boushehr Universities of Medical Sciences: A self-assessment. Iranian Journal of Medical Education 2010;10:101-10. Jafari Asl M, Chehrzed M, Ghanbari A. Quality of educational services from ViewPoint's of nursing and midwifery students of Guilan University based on Servqual model. Res Med Educ 2014;6:50-8. Abbasian M, Chaman R, Mousavi SA, Amiri M, Gholami Taromsari M, Maleki F, et al. Gap analysis between students' perceptions and expectations of quality of educational services using Servqual Model. Qom Univ Med Sci J 2013;7 (Suppl 1):2-9. Kebriaei A, Roudbari M, Rakhshani Nejad M, Mirlotfi P. Asssessing quality of educational services at Zahedan University of Medical Sciences. Tabib Shargh 2005;7:9-15. Enayati Novinfar A, Uosefi M, Siyami L, Javaheri Daneshmand M. Evaluation of the quality of education services of Payam Noor University of Hamedan based on the Servqual model. Q J Res Plann High Educ 2011;17:135-51.